PITTSBURGH (AP) — Casey DeSmith has seen it at every stop of his hockey career. Practice comes, the focus shifts to defending and the guys paid lavishly to score goals take their foot off the gas. There is an exception. Then again, there almost always is when it comes to Sidney Crosby. 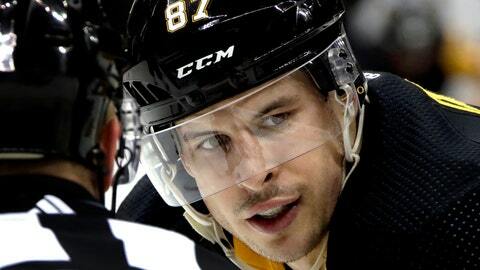 The Penguins captain — whose resume is stuffed with six 100-point seasons, a pair of scoring titles and two Hart Trophies as the NHL’s Most Valuable Player — has long been respected and feared for his creative playmaking. It’s his leadership and conscientious approach to every aspect of the game while stewarding the Penguins through a rocky season to a 13th straight playoff berth that has put the 31-year-old into the conversation for the Selke Trophy, given annually to the NHL’s top defensive forward. Both the metrics and the eye test heading into Pittsburgh’s first-round matchup with the New York Islanders provide a compelling case. Crosby won more than 55% of his faceoffs this season, his best mark since 2009-10. He blocked 43 shots and took away the puck from an opponent 54 times, the second-highest total of his career. After a talk with coach Mike Sullivan last fall, Crosby occasionally found himself killing penalties, a role he embraced and would have happily kept doing if not for concerns over his workload. Still, there are situations when Sullivan knows he needs the star he calls “the best 200-foot player in the game” to go do his thing. Nursing a one-goal lead late against Carolina on March 31, Sullivan sent Crosby over the boards over and over and over as the clock dwindled. Pittsburgh held the Hurricanes at bay and emerged with a crucial 3-1 win. Hall of Famer Sergei Fedorov was the last player to capture the Selke while scoring 100 points, doing it for Detroit in 1996. Crosby has an outside shot at joining that exclusive company when the league awards are announced in June. Not that Crosby, who has never finished higher than seventh in Selke voting, seems to care. Or maybe more than a part of it. Pittsburgh center Matt Cullen, at 42 the league’s oldest player, has carved out a 21-year career due in large part to his defensive expertise. Around the time he hit 30, Cullen knew he needed to find different ways to contribute beyond trying to put the puck in the net if he wanted to stick around. He sees Crosby taking some of the same steps not out of necessity but by choice, which makes it all the more impressive. Cullen likened Crosby to Michael Jordan, who was named to the NBA’s All-Defensive team nine times in addition to winning 10 scoring titles and leading the Chicago Bulls to six championships. “Sid’s accepted all the challenges of playing against the top lines and then going out and scoring, too,” Cullen said. Forward Jared McCann arrived in a trade with Florida on Feb. 1. The 22-year-old grew up admiring Crosby from afar. The up-close look has been even more revealing. McCann will find himself transfixed on Crosby’s No. 87 during film sessions, studying the subtle aspects of Crosby’s play in Pittsburgh’s end looking for tips that might translate to his own game, be it positioning, physicality or a sense on knowing where the puck is headed before it gets there. Coach Peter Laviolette has spent more than a decade trying to find ways to deal with Crosby during stops in Carolina, Philadelphia and now Nashville, with only occasional success. Which Sullivan believes separates Crosby from annual Selke contenders like Boston’s Patrice Bergeron and Los Angeles’ Anze Kopitar. Opportunities that typically begin with Crosby in the defensive zone, doing the dirty work others won’t in an effort to produce the highlights few can. “His ability to win faceoffs, his puck protection, his strength on the puck, his ability to control the game, all of those things, as important as they are on the offensive side of the puck, they’re just as important on the defensive side,” Predators defenseman PK Subban said.